Xena lives in troubled times. Hoodlums and ne'er-do-wells abound (not all that different from today). Xena may have to defend her own life or the lives of others at a moment's notice. In order to survive these little distractions, Xena has cultivated several attributes that serve her in such situations. This is perhaps her primary attribute in that it allows Xena to avoid trouble before it begins. Even when she is asleep [ A DAY IN THE LIFE (#39/215)] Xena remains alert. Try sneaking up on your cat. It is not the acute senses that make this difficult, it is her alertness. Your cat is paying attention to what goes on around her. Xena does the same thing. Xena is always aware of what is going on behind her. This is called "watching your six o'clock" by fighter pilots. Xena does not just look around, she also sees what is going on. Those three young men just standing on the corner not talking are probably up to something. Anyone whose actions seem geared toward her own is suspect. That fellow that was sitting in front of the tavern ran inside as soon as he saw Xena. To set up an ambush perhaps? Xena also closes one eye for a couple of seconds before going from daylight into a dark tavern. That way she can see immediately instead of having to wait for her eyes to adjust. She does not sit with her back to the entrance so she can see who is coming in. When Xena gave Gabrielle her first lesson in combat, it involved running away. You cannot run if you do not see it coming. Stay alert. Once the decision to act is made, there is no advantage in delay. Napoleon said (undoubtedly he was quoting Xena), "I may lose a battle, but I will never lose a minute." 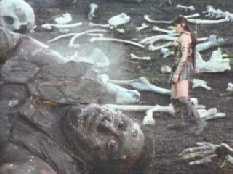 Once Xena sees that her life or the lives of others are in danger, she does not waste time. She carries out whatever actions seem most appropriate. Xena also remembers that a good plan executed now is better than a perfect plan executed too late. Xena is decisive. Even from a distance, you don't want to be a target for Xena's chakram. Xena harnesses the adrenaline supplied by the fight-or-flight response. She turns fear into righteous indignation (controlled anger). A small bird will drive a hawk away from its nest by pure aggression. Xena uses the same moral edge to overcome the odds. As the old-timer from western Greece said, "Git there furstest with the mostest!" The ideal fight is over before the loser even knows he is in a fight. There is a defense for every attack. Xena does not give her attackers time to implement the defense. If you lose your cool in a deadly encounter you will not likely survive to regret it. You must maintain your skills and mental faculties to deal effectively with an attack. Some of that comes with practice and experience but much of it is simply mindset and training. Xena has decided ahead of time what she is going to do in certain situations. If she has time to plan when an attack arrives, so much the better. But if she is attacked with very little warning (not unexpectedly because Xena always expects a potential attack) she has a "plan B" ready to deal with it. Xena's practice sessions develop the reflexes she needs so she does not have to stop and think about how she is going to draw her sword and begin using it. Xena values her life and the lives of potential victims over those of people who would attack the helpless. How these people came to commit these crimes can be discussed later, right now the goal is to stop them as quickly as possible. In fighting for her life or the lives of others, Xena will use any trick in the book. "All's fair in love and war," said Ares [ WHEN A MAN LOVES A WOMAN (#H51)]. 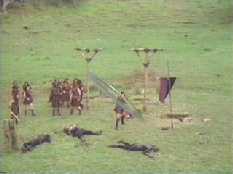 When someone starts a war, Xena will be ruthless and finish it. If she became overly concerned with the injury she might do to the criminals she would lose. in A DAY IN THE LIFE (39/215). This is the force multiplier (as they call it at West Point. Or was that the military academy in Athens?). The Trojan horse is a prime example of surprise. Surprise is generally associated with offensive combat. By its nature, defensive actions allow the attacker the first blow. Surprise is not easy to implement. However the mere existence of resistance to attack is often a surprise in itself. Highwayman: "Awright, ladies! Hand over the dinars or...."
Gabrielle: "I'm not cleaning up that mess." The robber was thinking about what he was saying and expecting compliance. When the counterattack arrived he was completely unprepared. Surprise! To see how these attributes can be applied in modern day defense against criminals read "Principles of Personal Defense" by Col. Jeff Cooper (Paladin Press, 1989). I am sure any similarities between Cooper's work and this article are strictly coincidental. Xena could not possibly have read his book.